Sorry for not posting in a while again, there are just so much things to do! I have been sewing a lot by hand, watching a ton of Jane Austen movies (wrong era but lovely anyway) . 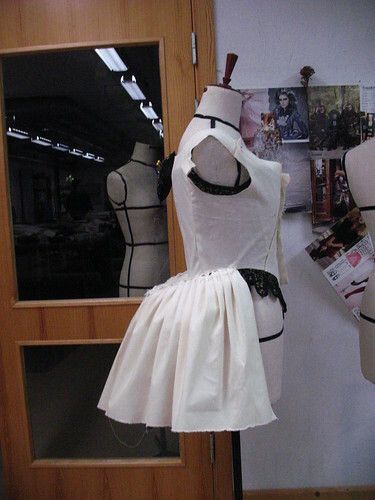 I have finished a chemise, a petticoat and almost a bumroll. I have the binding left on the bumroll but I wont do that until I get some proper stuffing, the polyester stuffing is just there for now. Polyester stuffing seems really off to use even it is is not seen, but after bothering with hand sewing and all I find it a bit of so I am stuffing it with wool in stead. Silly thing I don’t have pictures on them, but I will take some. So this month I had to pay the school fee for this semester so there is no way I can afford silk at the moment. 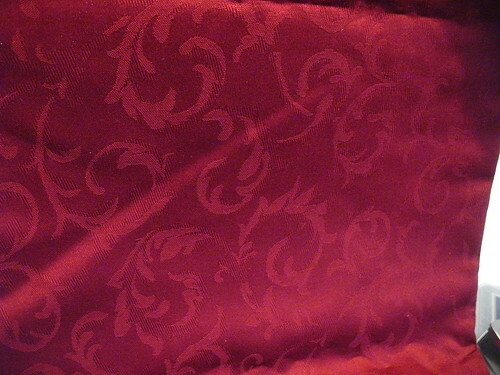 So I am making a addition to my 18th century wardrobe, A caraco made out of a red cotton damask my sisters hubby gave me for Christmas, and a matching skirt for it of course, but that might have to wait a bit. The pattern is made using a diagram from A History of Costume of Carl Kohler and it went together beautifully, when made up it comes out fitting a bust at about 84 cm (33 inches) but that is much to small for me but it was just to enlarge it. Is this a caraco? I am not sure, I am afraid that I am not entirely sure about what is what in the jacket department yet. I changed the tail part a bit, it did not turn out as full in the back as pictured on the diagram so I added some pleats to it. I am not really sure about the look of the tails, they seem a bit off, a bit to long or a bit to short, in a weird middle. I an not entirely convinced I want the pleats either, I might change it and make more of a full skirt kind of appearance and no pleats. 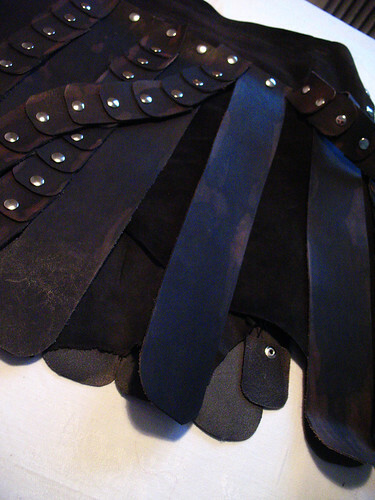 Here comes an in depth post about my Xena skirt. 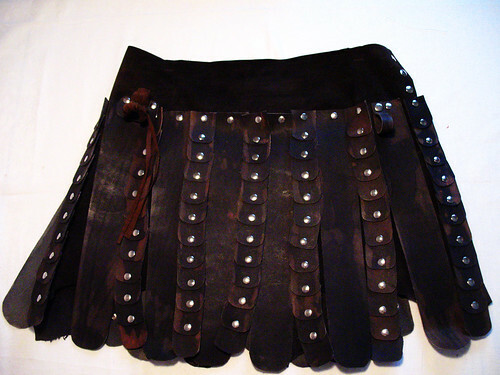 The skirt is made up with both long pieces that are rounded in the bottom, and small pieces that also have a rounded bottom, the small pieces are riveted together by hand and overlap the long stips. 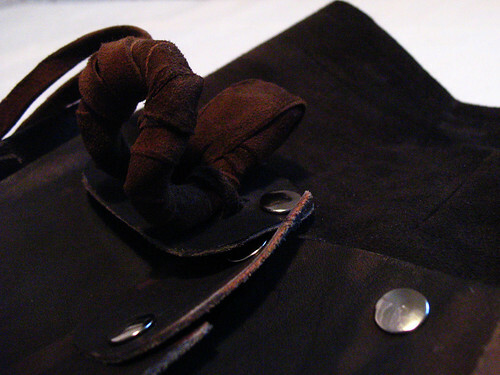 They are all hand cut from a vegetable tanned cowhide and then coloured with leather colour. 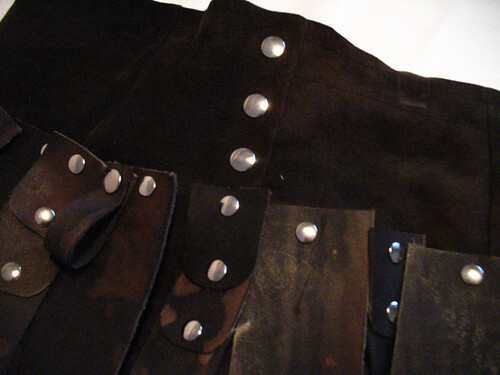 The pieces are riveted to a underskirt in the top, the do not go up entirely to the top since I am wearing a corset over it so I don’t want unnecessary bulk added on my hips. In the front I have a loop to put my whip in, and a hook to put mychakram on, I have a leather sting to secure it to the hook, since I am not using it and I don’t want it to fall of while wearing the costume. 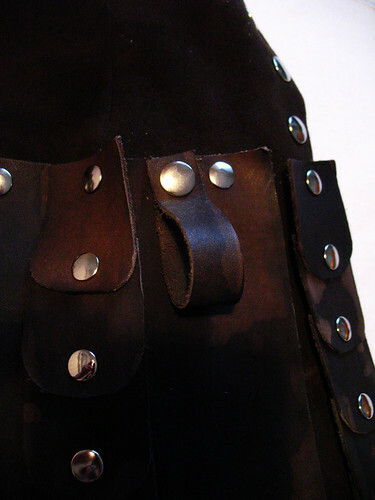 The holders are also both riveted to the skirt, the loop for the whip have a snap closure, so it is easy to just secure the whip, and also easy to just pull it of. 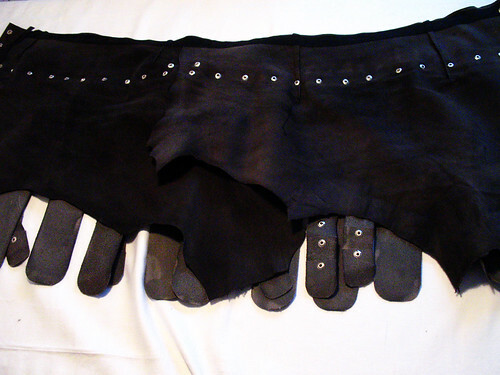 The underskirt is made out of a scrap hide, I got if for no money at all and it was an ugly grey green colour. 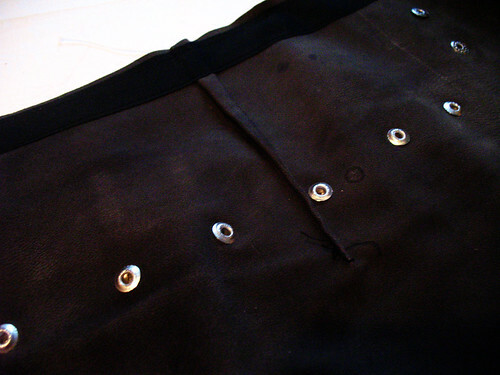 It have been cut in two and have been coloured and then I sewed darts in the waist, just like I would do on a regular skirt front and back. 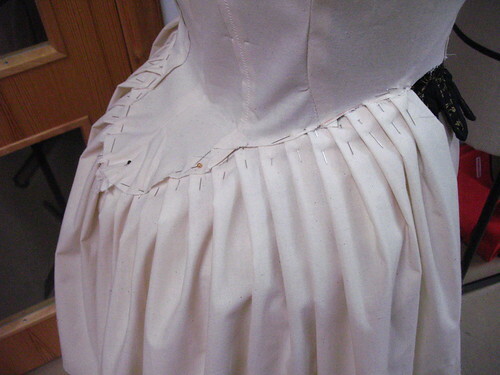 It also have a waistband made out of Petersham ribbon. 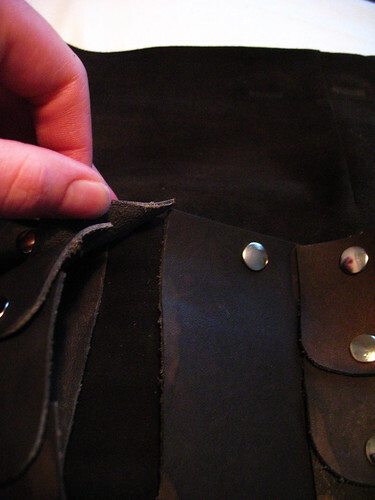 Since it is leather the waist would naturally have stretched, a non stretchy waistband prevents this. 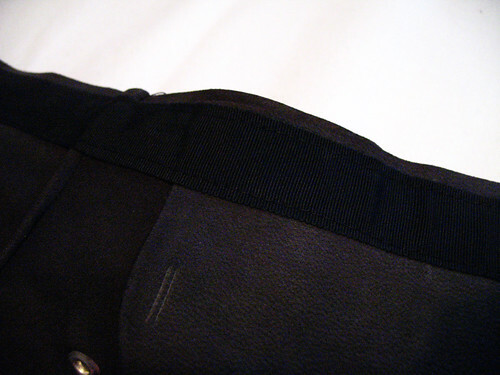 It is also the waistband that holds the back and front piece together. 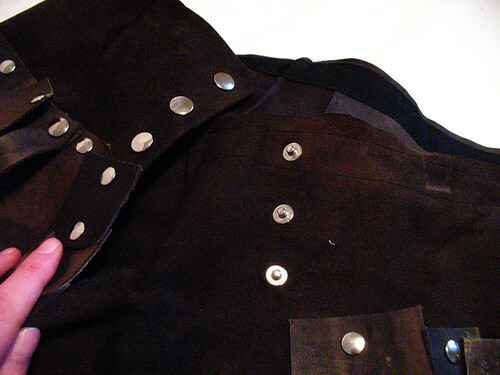 It closes at one side with press buttons, the leather overlaps a bit. So I have been quiet for some time, school starting again and a new year to, this new years resolution, sew and wear more dresses the same as last years. 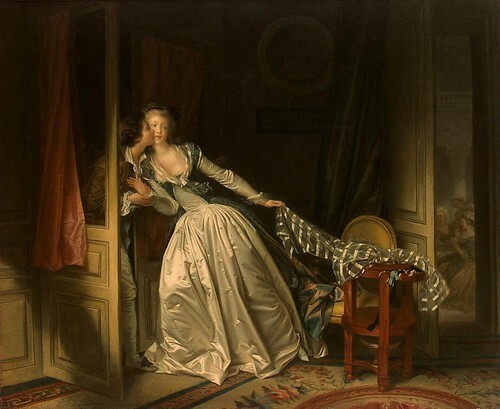 So what is all this about 18th century, well but yes, I had that grand plan about the green Madame Pompadour dress last winter, but it was to much money for the silk, not the right colour was anywhere to be found and it all ran out in the sand. So first I needed to finish my pair of stays I started February last year but never finished. 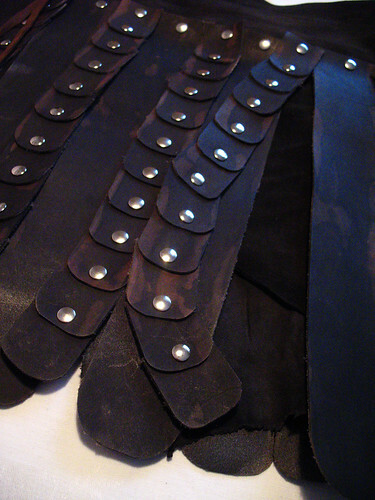 The only thing left was to deal with the shoulder straps and bind the top. 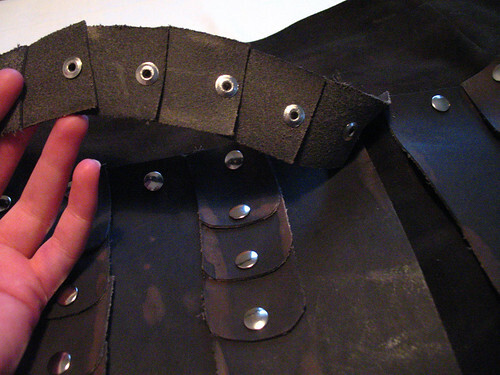 The shoulder straps did not work with my body and the issue seemed hard to deal with at that time, I was just to lazy. 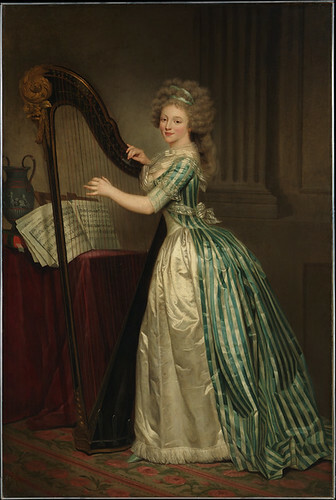 So yesterday I researched the internet for a while looking for sources for pair of stays without the straps, since I have seen people do them before so I hoped that there were some historical sources to support that. 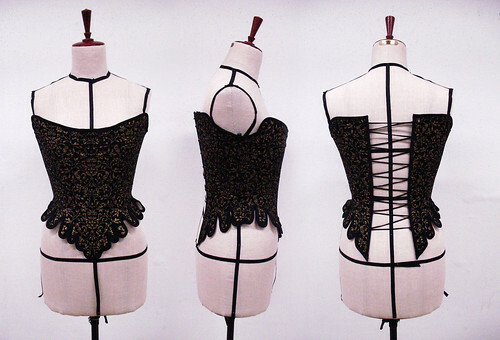 I found a bunch of drawings and over at http://www.laracorsets.com I found that her two oldest corsets both had no straps. So I just chopped my of to! 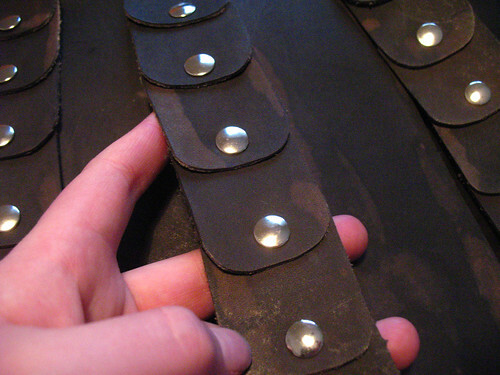 It took about 1 hour to take out the steel boning and trim them to new lengths, cut of the straps and some of the back and then bind it. And then I needed a pattern for the dress. 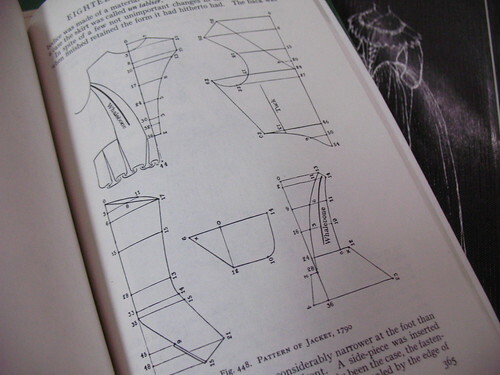 I had gotten a new book this Christmas it was “A History of Costume” by Carl Köhler and it actually had a diagram over exactly what I needed, the diagram was easy to follow and it was easy to draw a pattern from, I just needed to fix it to my size but that was easy to. 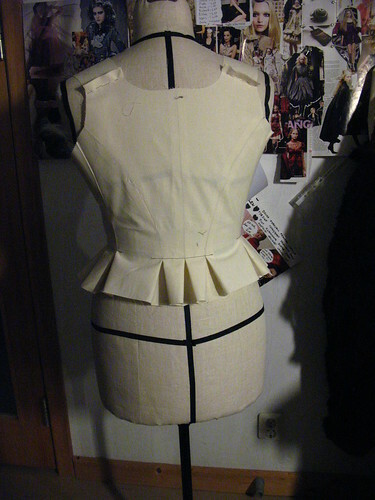 After one mock up I had a nice bodice to work from. 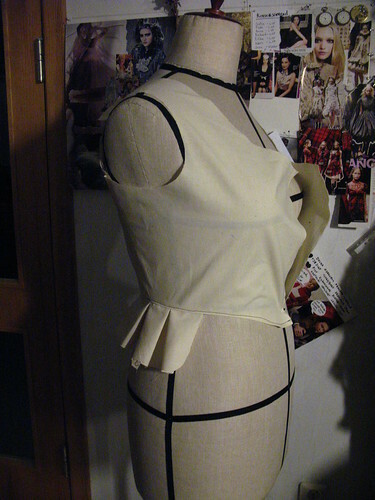 Then I made a makeshift bum roll out of scrap fabric and pleated some fabric to see how much I might need for the “over dress” part. 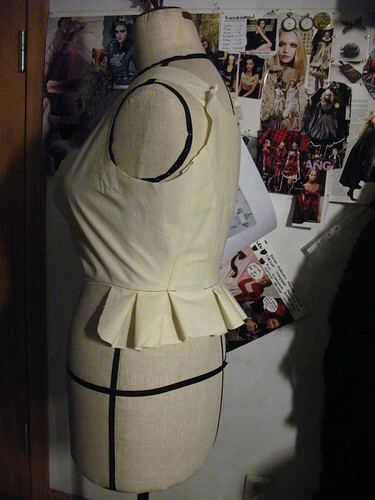 I am making the dress “en fourreau” so ignore the incorrect shape of the “tail”, It will also have more seams in the back but since they are not shaping anything I ignored them in the mock up.